Provide high-quality care based on quick access to patients’ advanced care planning documents. A provider’s primary goal is to deliver proper care that will ultimately lead to positive patient outcomes. And in doing so, providers want to minimize errors while getting to the problem quickly. That requires quick access to the most up-to-date patient information available. Many patients’ records, however, are scattered across multiple physicians’ offices and other care providers and may not always reflect the patients’ current treatment preferences. That means the treating physician may be making important decisions based on outdated information, especially regarding end-of-life care. Care Directives’ Advance Directive Information Exchange (ADiE) gives providers real-time access to patients’ treatment preferences right at the point of care. 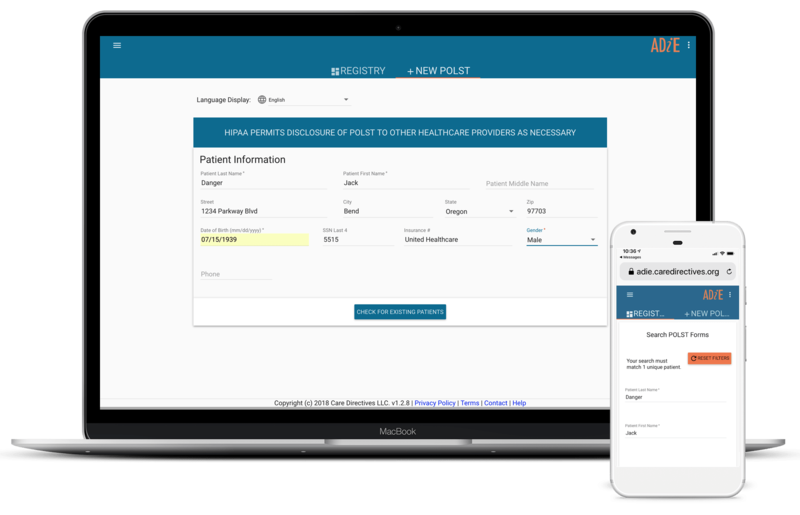 Providers can access a cloud-based repository to view advance care planning and end-of-life care planning documents, like POLST/MOLST forms, Advance Directive, online medical directives, and more. ADiE fits into physicians’ existing workflow systems so they can have current patient data readily available to deliver better health outcomes.